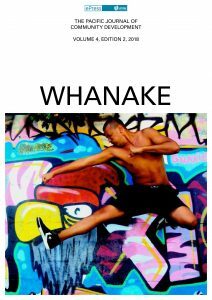 Whanake: The Pacific Journal of Community Development is a bi-annual digital journal for practitioners and academics who love community development. This issue features articles on youth volunteering, voluntourism, discrimination against gender-diverse tertiary students, poverty in Aotearoa New Zealand, youth HIV/AIDS awareness in Papua New Guinea, and a consideration of the Pope’s Laudato si’ encyclical in terms of CD practice. It also includes reports from the recent World Community Development Conference in Ireland and the associated IACD conference exchange.